Featuring: Jensen Ackles, Neil Patrick Harris. Director: Brandon Vietti. Alright, I'll admit it. I'm a total nerd when it comes to comic book cartoons. I used to watch Batman, the X-Men, and Spiderman (hell even The Tick) religiously every Saturday morning as a kid. There really is nothing as awesome as a good comic book cartoon. I never really got into comics themselves, but the cartoons, always made me drool. The last few years or so DC Comics has been putting out a ton of awesome animated features that take me back to those Saturday mornings of adolescence. They're all very well done and if you are in my age group and had similar experiences as a young boy (or girl), you'll appreciate this too. I won't really go into the story because that'd ruin it. 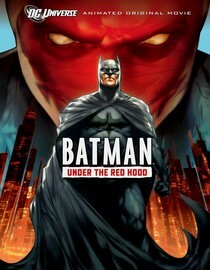 If you like Batman and like comic book cartoons just watch this. If you don't, then meh. Why is it in your queue? Because it's Batman! Is it artsy? Nope, it's Batman!. Best thing about the movie? See the answers to the last to questions. What mood should I be in to watch this movie? Saturday morning classic cartoon watching kinda mood..
Do you think this would be ok for my kid? He loves superheroes too. Keep in mind, he's watching the Star Wars trilogy when answering. Well, it's rated PG-13, so expect a PG-13 sort of experience. The violence isn't over the top but it's still pretty violent. The Joker is a sociopath. My rule of thumb would be if you would let him watch The Dark Knight, he can definitely watch this. If you didn't let him watch that, expect this to be slightly less dark and violent than that. Well, we started it, but I convinced him to stop a few minutes in and watch Spiderman cartoons instead. This is a little more his speed.